More and more Americans are living in urban areas. In the past 50 years, the percentage of those living in cities increased by 10% and in the United States, the degree of urbanization is currently over 81%. This is a worldwide phenomenon, though. While North America has the highest urbanization rate, Latin America and the Caribbean is very close with 80%, Europe is at 74% and the worldwide average is 54%. This trend has an effect on my industries, such as agriculture or the job market but it contributed tremendously to the growth of the construction industry. The more people move to the city, the more buildings and roads are necessary. While we enjoy the comfort of big cities, we rarely take into consideration how much energy and raw material was used to make it possible, although, it would be crucial. Why? Because we are starting to run out the most important engineering raw material, sand. Sand is used in countless everyday items, such as toothpaste or microchips or glass but it is also the main component of constructions. A great amount of sand is used in the sub-base of buildings but the cheap, durable, easily formable and therefore popular building material, concrete is also mostly made up of sand. Just an average family house requires about 200 tons of sand and to build 1 mile of highway 45,000 tons of sand is necessary. Although these numbers partially explain how a sand scarcity can occur, one might ask how we can be running out of sand if the deserts, such as the Sahara which alone covers an area of 3.2 million square miles, are still preserved. 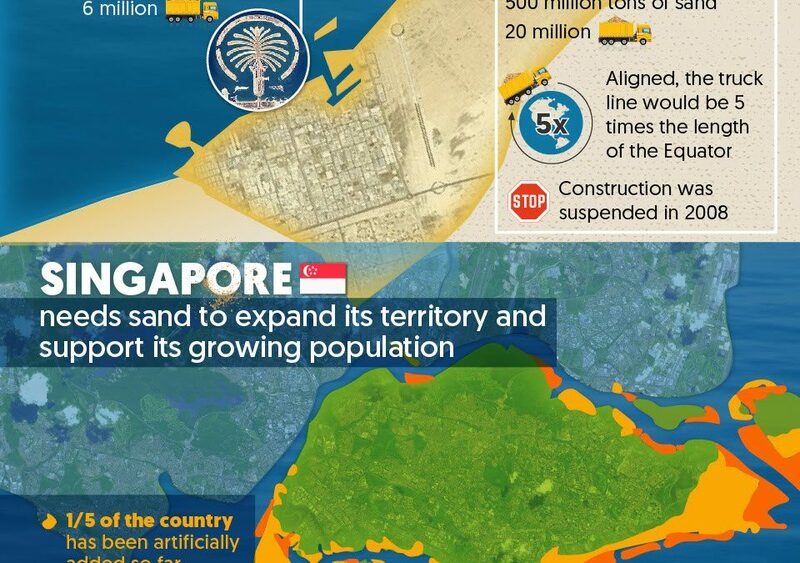 The answer lies in the fact that only marine sand is adequate for construction. Through the fine erosion of wind, the grains of desert sand becomes round and smooth and thus can’t provide a stable structure for constructions. Marine sand grains, on the other hand, are more angular and therefore sufficient for stable structures. Therefore, the overwhelming demand for sand coming from the construction industry is exclusively for marine sand. The marine-sand scarcity already has its effects, both economic, environmental and social. In the U.S. the price for construction sand has been gradually increasing in the past years and in countries where the scarcity is more severe, such as Vietnam, the prices have increased drastically. But even if one can afford the monetary costs of sand, the environmental costs are becoming unbearable. The sand we used is extracted from a place where it naturally belongs and it has an important role. The seabed is the natural habitat for countless marine animals and through sand mining, we are endangering species and disrupting the food chain. The beach also has the natural function of preventing salt from seeping into the soil and preserving its fertility. Last, but not least, the high demand for sand is also taking its toll on society. The black market realized the potential in sand trade and worldwide illegal organizations are mining sand. Not only are they not considering environmental aspects when doing so but they are also taking advantage of people in need. In the Maldives, for example, sand fishers dive 50 ft deep in order to bring sand up by the bucket for 14$/day. The activities of the sand mafia had led to the death of hundreds and the situation is just becoming worse. It is time for something to change. The toll for consuming sand at this rate is too high, alternatives must be developed. While some are already working on solving the issue, the main problem is, is that the majority is unaware of the sand crisis. To first step is to become informed and inform others. If you want to learn more, take a look at the following infographic from TradeMachines and help raise awareness.